The Bugproof Swag is the deluxe model of the Outback swag range. The swag stands up on steel pole setup, lifting the canvas off the body of the camper. The square design at the head end of the swag allows plenty of head room and by opening the window the camper can access some fresh air and also check the happenings outside. Getting in and out of the canvas swag is easy with the Bugproof model, simply step in and out of the swag from the top, there is no need to roll out of the swag onto the damp ground, as you would with side entry swags. The top of the swag features a large canvas cover flap to keep the weather out and zip up flywire screen to enjoy the night air and glaze at the stars on those warmer nights. An internal pocket provides a handy spot for keys and wallets. The swag features a sturdy and durable steel pole system which can be easily erected in minutes unlike the fiddly fiberglass rods on imported domed swags which break easily. The Bugproof Swag can even be simply tied to a bull bar or tree, or alternatively it can be used flat on the ground or indoors. All Outback Swags are made from Wax Converters 100% cotton 12oz Cannonball Swag Canvas. Swags require a 100% cotton canvas for high breatheability in such confined areas, rather than the poly-cotton blends used in tents and many imported swags. Inferior materials such as poly-cotton do not wick enough water away, and the moisture in every breath will condensate on the interior lining of such a swag, it is alomost like sleeping in a plastic bag! We also use the same canvas in the base of the swag rather than the cheaper PVC bases for several reasons, canvas in more durable, it’s a better insulator and you won’t get high condensation between the swag floor and the mattress. The Bugproof canvas swag is available in a single, extra large single and double sizes. The Outback Bugproof Swag has a zip up flywire inner flap for summer and a canvas outer flap for winter. A large window in the back for ventilation. 12oz heavy duty waterproof Australian made canvas. Full length heavy duty zipper on top flap. 50mm high density foam mattress for extra comfort. Removable and washable mattress cover. The Outback Sturt Camper Trailer is so easy to use. Call Getaway Camper Hire on (03) 9783 6005 for all of your hiring needs. Outback Campers is a proud member of the Australian Manufactured Camper Trailer Guild. 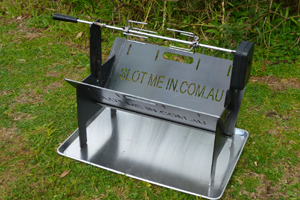 Outback Campers now proudly stock the Slot Me In wedge fire pits. 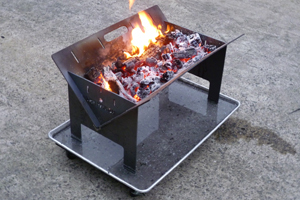 The Wedge can be used as a simple fire pit, or fitted out to suit camp ovens, hot plates, fry pans and even a battery operated spit.